Welcome to the Oh! 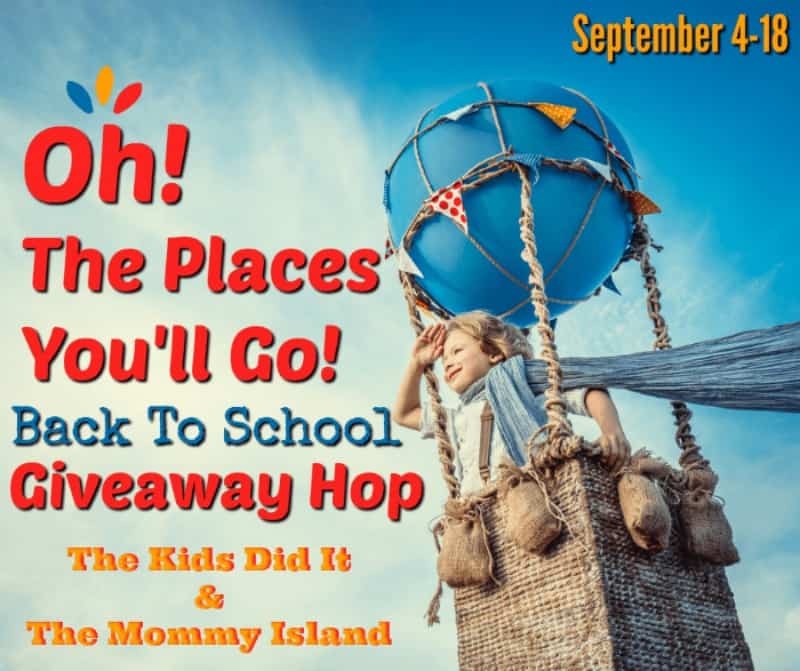 The Places You’ll Go Giveaway Hop! The Kids Did It and The Mommy Island in this fun hop! We are so excited to share ALL the amazing giveaways with you! These fun giveaways end 9/18/18 at 1159p est! Be sure to visit them daily for more chances to win! This Blog Hop is for fun prizes and Gift Cards for the kids and, of course, we can’t leave out their 4-legged friends! The kids are either in school or heading back soon and will be needing all kinds of supplies! But, even pups with blogs need office supplies – go figure 🙂 I am one of those that is just an office supply addict! I can never get enough pens, cute notepads, clips or whatever. Whatever the case may be, we want you to have a little something to shop with! Enough chit-chat, or woofs, as Miss Molly would call it. Let’s get on to the giveaway! $15 Paypal Cash OR an Office Depot/Office Max Gift Card! Giveaway ends 9/18/18 at 11:59 pm ET! Open World Wide to residents 18+ and older. Be sure to come back daily to get the daily entries! I like to collect supplies. I dislike running out for them last minute. I actually love collecting office supplies. Something about it… it’s just fun to shop for and always having what you need! I love office supplies just for fun! I get them because I need them. I only buy office supplies when needed. Which is not very often. I love trying fun post its or office supplies in bright colors. Out of curiosity, do you love collecting office supplies or just get them because you need them? I like to collect pens. I get them just because I need them. I just get them when I need them but somehow they keep taking over around here. I only buy what I need at the time. I love getting office supplies just for collecting. I’m obsessed with gel pens and different colored pens! Oh, I’m a total collector of office supplies! I buy them whether I need them or not, but I do use them all. So, it works out. I mostly get only what I need in office supplies. Any extra space I have is for crafting supplies! Thank you for the chance to win! I do have a slight addiction to office supplies!! I like having a stock pile of supplies. I like collecting some office supplies like pens. I am a super pen snob and so tend to horde pens. I love collecting office supplies. I only buy them when I need them. I usually get office supplies because I need them, but I love collecting mechanical pencils, pens and highlighters! I like to stock up. For the most part I just get office supplies when we need them but they do have some great looking choices these days. I think I have an unnatural love for office products. I LOVE getting school supplies! It depends on the supply, but for the most part I get them when I need them. I love stocking up on them. Im nurse and I like to collect pens! I always need office supplies plus I have a daughter in college who is always in need of ink or paper and pens! I collect office supplies! Back to school clearance is the best time to get them. I need to be stocked up but never am. I love having fun supplies. I collect them….but they all get used eventually! I get school supplies only when they are needed. I’m a minimalist so I don’t like collecting anything. I only get supplies when I really need them. I try to get only what I need and I’ll use. I do end up buying and collecting more notebooks than I need. I do like them. I do need them too, and I ahve a daughter whose in high-school. I get them when needed. I just get the office supplies that I need and will use. I’m a minimalist. I try to buy office supplies only when I need them. I get office supplies because I love them! I’ve always had a obsession for them. They help me feel more organized. I only get office supplies when I need them. I have resisted going crazy on supplies because of saving money, but I’d sure use this gift card! I love office supplies. I can usually come up with a reason to buy them even if I don’t need them. Cant pass up a great sale or free. My stash is really good. I collect them so we never run out. I used to collect but now I’ll get what i need. I like to collect office supplies. I love them… I do need them to, but I like to get nicer than what I need, if that makes sense! I love collecting pens but have been pretty good about condensing my collection though! I just get them because I need them. Only if I need I get. I like to collect pens. You can never have enough pens. Love to shop at the office stores! I have a home office, so I love collecting office supplies! I collect pens and notepads – Love that! I’d say my purchasing office supplies is probably half from need and half from loving them! I get them because I have to. But I do love getting office supplies that are more decorative. I don’t necessarily collect them, but I will buy extras when I find a good deal !! I’m a small collector! I try to not let my collection get too big. I’ve always had some weird obsession with office supplies. When I was a little girl I would walk downtown and buy pens, pencils and all kinds of notepads with my allowance. Now I order office supplies for work and it’s one of my favorite things to do! We get them because we need them. No, I don’t collect office supplies. I happen to have a draw full of pens but not on purchase!! I only buy out of necessity. I hate clutter and donate to local church at the end of year. I like getting office supplies when on sale, do not like running out. I like collecting ink pens once with different buisnesses on them. I normally just get office supplies because I need them, but I’ve been known to splurge. Thanks for the giveaway! I only buy office supplies when I need them. If I won, mine would go straight to needy school children in my area. I usually get the ones I need. I really just get them when I need them. I definitely collect office supplies. At least the internet has let me know I am not a lone weirdo, lol. I get them as I eed them I use them a lot as a homeschool mom though. I usually just get what we need at the time. I use them. I like notes and things like that. Thanks so much. I mostly just get them to use. I like them because I always need the,! I enjoy collecting office supplies. I work in an office and have always loved supplies!! Fun post its? Bring it on! I just get them when I need them. Although, I do love me some post it notes. I like to collect them…never want to run out! I only get them when I need them. Mostly because I need them. I am a collector and love gel pens and different types of notebooks! I buy them because I need them. I like to collect things like markers, notebooks, post its, and hi lighters. But that is about it. Everything else, I get as needed. A bit of both, I have a ton of pens and such I don’t really need. I am half and half on that one. Some I like to have a lot of and others they just seem to accumulate and I have no clue from where. I don’t collect them due to space limitations, since our place is tiny. 🙂 I just get what I need! I love office supplies, especially post it notes! Back to school shopping is the best. I stock up when there’s a sale! Collecting for sure. You should see my collection of various Expo markers. I do use them frequently at work, but I always buy more! I like to collect supplies. I have a closet full of office supplies and I keep buying them when they are on sale. I’m definitely a collector of office and school supplies. My husband is the worst, he buys stuff just because it’s on sale often. I love collecting office supplies! I love colorful office supplies! My favorite section of the store to browse through. oh my god, thank goodness it’s not just me with an office supply problem. yes, i collect them! i have always loved office supplies. i collect them but i use them also. I have quite a collection of office supplies. I probably won’t be able to use up all the pens and pencils I have in my lifetime. I pretty much just get them when I need them….but I do like to win pens and such….as eventually I will need them, and they are cool! Thanks and God Bless! I admit it I love collect office supplies so I have them on hand when I need them. Both. I have a thing for pens and colorful Post It notes. I only get office supplies if I need them or if they are on sale and I cant help but buy them because they are so cheap. I tend to get office supplies only when I need them. Thanks. I just get office supplies as I need them. I love office supplies and I enjoy collecting different colored pens. I love office supplies and can never get enough! I always have tons of office supplies so I suppose I collect them. I tend to buy more when they’re on clearance. I love collecting office supplies, especially different kinds of pens. I like having extra supplies on hand so I do stock up. I love collecting office supplies for writing poetry. The Uni-Ball Vision Pens in bold and the Black Warrior Pencils are so smooth that they practically write by themselves. Browsing office supply stores is something I do once a month. Yes I must have a stack of spiral notebooks around me at all times for some odd reason! I do stock up when things are on sale or clearance. I usually have at least 10 notebooks on hand.. I don’t really collect office supplies. I love receiving them from other people, but I usually only buy office supplies if I absolutely have to. I usually get things because I need them. I like collecting pens, but I try to keep it to a minimum. I would say I’m somewhere in between. I don’t exactly collect them but I like the feeling of getting new supplies and I make sure that I have a good supply on hand and get supplies as soon as they start to run low. I am addicted to office/school supplies!! Guess you could say I have never stopped learning!! I have waaaay more office supplies than I need but cannot keep myself from buying more. It is a need. Except for scented markers. I usually just pick up what I need. As needed. Unless something catches my eye! I stock up on supplies every time I find a sale. I get them as I need them. I just get them when I need them for the most part. I love to collect office supplies! I get them because we need them, but since we often need just a portion of some more specialized items, we end up with extra supplies that we don’t want to get rid of since the need might arise again. I stock up when I find a really good price on something that I always use. I hate running out of something in the middle of a project. I typically get them when I need them. I like collecting them so I never run out of what I need. I usually buy them because I need them. I am always needing pens, printer ink, and printer paper. Some of the other stuff is fun to collect. I collect pens and post-it notes. I have so many! I get office supplies because I need them. I get office supplies only when I need them. I have been obsessed with office or school supplies since I was a kids. So yes i do buy for fun but also things I actually need! I usually just get them when i need them. Oh my goodness, I love love love office supplies! I love different color post its and pens and I love paper clips. Folders to organize everything in… I could go on and on. I buy them for my class and to make baskets up for my grandkids teachers! I get them because I need them. Although, I do love a cute pad of paper or cute pens! We have kids in school, so we need office supplies on a regular basis ! I buy office supplies because I need them, and it’s handy to have a few extra pens if someone needs one. I do like collecting them. I must say, if I get office supplies at this point, it’s strictly because I need them. I used to be a huge collecter though, when it comes to pens/ pencils/ etc. I like both ways, but I love to get into liking them, not just needing office supplies.